The Faculty of Education (FEd) held its Recognition Rites and Fellowship Program for the students under two undergraduate and nine graduate programs on September 22, 2017 at the Audio-Visual Room (AVR), University of the Philippines Open University Headquarters, Maahas, Los Baños, Laguna. The program commenced with the national anthem led by the UPLB Lisieux Music Ministry. It was followed by a speech from Dr. Ricardo T. Bagarinao, Dean of FEd, who gave his opening remarks, acknowledging the students for achieving a yet another remarkable goal in their lives. 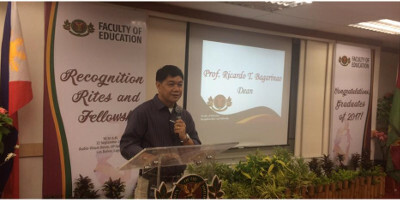 He emphasized on the tussles of an online learner compared to the conventional classroom-based student. Dean Bagarinao’s opening remarks to FEd graduates. Tayo ang magdadala ng liwanag, tayo ang Renaissance ng lipunan sa panahong ito na hindi tayo sigurado kung ano ang magiging bukas. Chancellor Melinda DP Bandelaria greets the graduates. The presentation of graduates by program came next. Out of 129 graduates under FEd for the AY 2016-2017, fifty-three attendees received their certificate of completion, one of them received a special award. 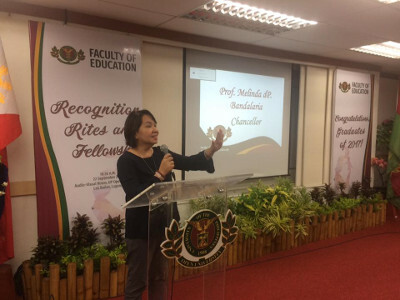 Dr. Maria Rowena D. Raymundo delivered her inspirational message leaving the participants with three main guide points of advice on life after graduation: (1) preservation of attitude of gratitude; (2) application of knowledge; and (3) repayment for the people who helped throughout the course. Dr. Raymundo as she enumerates her three main advices. Ms. Maria Rita T. Macabasag, Bachelor of Education Studies (BES) candidate for graduation, told her success story as a BPO employee who turned into a degree holder in an open distance and e-learning community by which she proved that it is never too late to fulfill one’s dreams. Ms. Macabasag tells her struggles before having a Bachelor's degree. 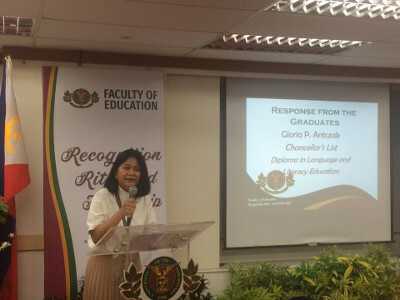 Ms. Gloria P. Antczak, who received the Chancellor’s list award under the Diploma in Language and Literacy Education (DLLE) program, also shared her response message to fellow graduates wherein she reminisced momentous times as a student. She quoted a few lines from John Piaget that says, "The principal goal of education in the schools should be creating men and women who are capable of doing new things, not simply repeating what other generations have done." Ms. Antczak as she humors fellow graduates.